The name of our cabin says it all 'Anglers Hideaway'. Purchased and managed by two college buddies who have been fly fishing together over fifteen years, this property is the perfect place to get away from it all and do some fishing. 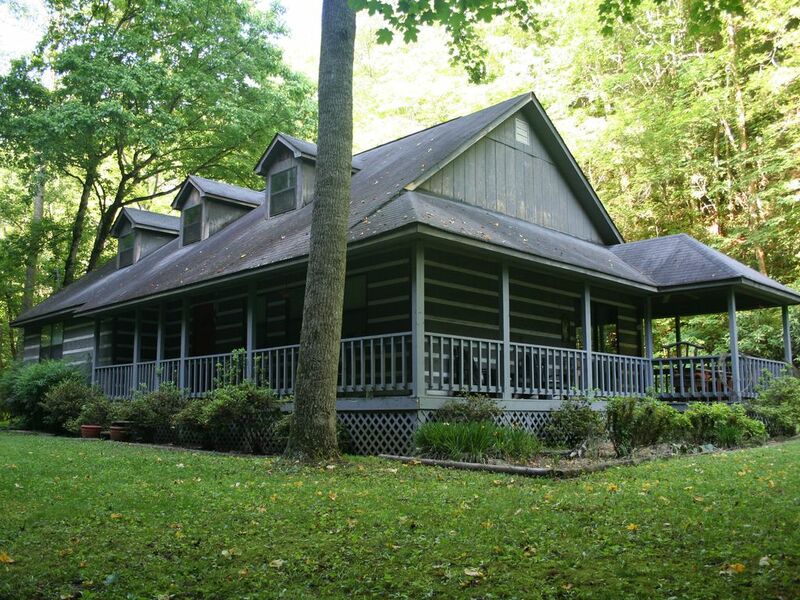 Located on the beautiful Hiwassee River in southeastern Tennessee, this cabin is close to all the action. Twenty minutes south and you can be rafting on the Ocoee River. Thirty minutes north you can fish the famous Tellico river in Tellico Plains, TN. Or you can just stay on the Hiwassee River while rafting and fishing! Whatever your daily activities entail, you can rely on one thing; the evening at the cabin will be unforgettable. Enjoy relaxing in a rocking chair on the porch, or plan a cookout using the grill. Inside you will find a full kitchen, laundry room, dining room, large loft area upstairs, and a comfortable living room for relaxing inside. Check out our pictures and come see our Hideaway. Rafting: We have information on rafting the world class Ocoee River which is only minutes away from the cabin. We also have information on rafting the Hiwassee River which is where the cabin is located. You will find class 5 rapids on the Ocoee while the Hiwassee is a class 2. Trout Fishing: Fish the Hiwassee River. Several miles of trout fishing, guides are available with the Hiwassee Outfitters. Or fish the Tellico River just minutes up the road in Tellico Plains. Sight Seeing: Motorcycles are welcome and encouraged to come and enjoy the beautiful scenery around the Cherokee National Forest. There is a winery on Hwy 411 and a many areas for a Sunday drive for the leaves of the fall. The master bath is large and has a tub/shower and toilet. The guest bath has a tub/shower, toilet, and large vanity. We always enjoy our visit to Angler's and are never disappointed. This year was no different with good friends, good fishing, and good times. We look forward to another visit. We stayed here the weekend before Thanksgiving. That's pretty much the end of the season for the area. If you want to get away from it all, this is the place. Loved the covered bridge entrance and the creek. Thanks Al! The Fall is a great time to be in the woods. Please come back and see us next year. We spent Five days and wish it was more. Our stay was so enjoyable and stress relieving. Quite a few lights out. Smoke detector not working in master bedroom .Major Musty smell, the loft quests reported the worst of the musty smell.. Road is not marked well enough without asking local people how to get to the cabin. Terry, sorry you had a bad experience with the things you listed. We've discussed these with the house manager and they're being taken care of. My husband, son, three dogs, and I evacuated Hampstead, NC, at the last minute due to the incoming hurricane, and we were lucky enough to book Anglers Hideaway cabin at the last minute. We arranged everything through Rusty, one of two owners, and he was amazing to work with. Rusty went above and beyond to accommodate us, and he was incredibly friendly. The cabin itself had everything you need for a comfortable and relaxing stay. My favorite part of the property was the shallow stream that runs in front of the cabin. We enjoyed frolicking in it with our dogs! The location of the cabin feels very secluded in that it has its own private entrance, yet the Hiwassee Outfitters camp ground is around the corner (but not in view) and there is one more cabin up the road with a separate entrance. Such a cool and beautiful location! There is also a lot to see and do in the area, such as hiking, fishing, river rafting, tubing, etc. I recommend checking out the suspension bridge in town. When we didn't eat at the cabin, we went up the road to Flip Flop Burgers. Our teenage son especially spent a lot of time there, so he could use their WIFI! The owners, Bryan and Mechell, were super friendly and the food was delicious. Their restaurant has beautiful views of the Hiwassee River, and the ambiance was amazing. Our other favorite restaurant was Lottie's, which is off new Highway 411 in Benton. Excellent service and comfort food. Overall, we had an amazing time and highly recommend Anglers Hideaway! Thanks again, Rusty! Thanks Emily! Sounds like you guys took full advantage of a hurricane evacuation. Don't wait until a storm hits to come back and see us. Take care. Perfect for our family of 5 adults and 3 small children. Our main purpose was for the guys to trout fish in the Hiwassee River, while the creek next to the cabin was perfect for the 2 and 4 year old to think they were fishing with their rubber hooks. Also, creek water just right for them to play in. Hot 1st week of July but shade made it perfect. No cell service which made family time even better. Cabin is much larger than pictures look. Great place! Can't wait to go back! Thanks for enjoying our place. We are glad you had fun and experienced the property like we do. No cell phones, kids in the creek and bonfires! Look forward to having your group back again soon!